Tabor saddles reinvent themselves to conquer market share. Tabor aims its saddles to the international market. If you are a fan of Tabor saddles, don't worry about the blog title. Our saddles won't loose any of the characteristics that make them so admired and unique. We are aware that when it concerns tradition, the rule of thumb is to change as little as possible so that we don't loose what makes it genuine and distinctive. What the brand is about to change is mostly the product presentation. Tabor intends to trace new means of communication so that more people in the world can realize and begin to contemplate what the Portuguese people have known for so many years. That being said, there's nothing to fear from those who have been fans since decades ago and are still an admirers of an item which is a "cult" saddle for many. Have you ever ridden a Portuguese vintage bicycle? If so, one of the found memories you'll come by is the comfort of those old leather saddles with large, heavy springs and, quite probably, that saddle would have been a Tabor saddle. Tabor was established in 1965 and is still working today. The company soon realized it couldn't let its main product (Tabor saddles) die. A product that made the brand gain a network of dedicated customers and followers who carried its name across the entire country, keeping it alive not only in the memory of some but also in the newcomer communication media as Facebook for instance, and across a variety of other web-based social communication channels such as Instagram, Twitter or Pinterest. Nowadays, Tabor is part of a larger business cluster lead by "Ciclofapril" whose main area of trade dedicates itself to precision sheet metal cutting and welding. Tabor has experienced some turbulent times: the long recession on the saddle market had its impact on sales and the company was forced to shift its main course of action without ever letting go of the saddle manufacturing. Today, Tabor income doesn't rely solely on the sales of bicycle saddles. However, if it's true that Tabor is no longer financial dependent on its saddles, those very same saddles are the flagship product that stand as the trademark of the name Tabor on the global market. It once was in the bicycle segment that Tabor brand became an icon and it's also on the very segment that Tabor intends to regain its "breath", reaching further every day. "The international market is set as our prime goal". Tradition. Long admired brand in Portugal, namely in the region of Águeda for several decades now, it pretends to introduce itself to the rest of the world with a re-branded, prestige image. The name Tabor in Portugal was consolidated quite a few years back and is now established as one of the most important saddle brands, with a well greased sales machine... Taborsaddles is a brand embraced with "tender love" and care by the Portuguese customers with domestic sales ranging from 1.000 to 1.500 saddles on a yearly basis, thus turning the market growth possibilities very reduced. As such, Tabor intends to pursue new, already targeted international markets to expand its sales namely in the Northern European countries. The breath of fresh air, the re-branded image of Tabor, is most perceived in the "soul" that its administration intends to imprint into the saddle product rather than in radical changes mainly because the customers reactions to dramatic changes have been revealed to be counterproductive. The most visible aspect of the changes the brand is going trough, other than a "slight" retouch on the brand image will be the way in which the product will be presented to the general public, acquiring more "glamour". The saddles have been sold, over the years in bulk, stacked in large plastic bags directly to distributors or bike component stores. Long due to its fame it required something better: Nothing overwhelming, just a box made of cardboard, printed in black to highlight the finest visual qualities of the saddles, specially made with the final customer in mind, offering a higher, and more prestige package. Tabor saddles fan group joins around social networks. By the time Tabor opted to start its new phase of marketing strategy, aiming the international markets, was confronted with a pre-existing Facebook group dedicated to "Tabor Saddles". Ever-since, Tabor began to interact with this group with 100 members founded by Tiago Monge Santos, from Aveiro, Portugal. 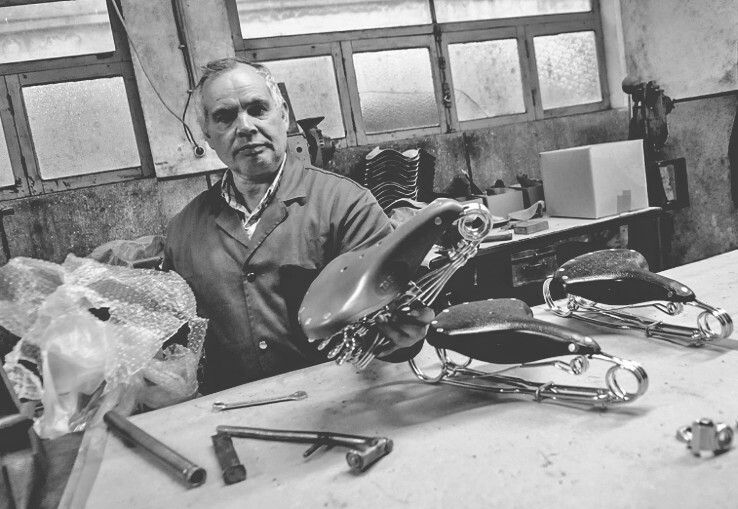 According to Tiago, Tabor saddles have always been part of his life; “I've always known the vintage ‘Yé-Yé’ bicycles equipped with tabor saddles made from natural leather and big chromium springs”, stating that the fact of them being manufactured in natural leather “gives them that old, vintage looks that get prettier over time” and the fact that the saddles “naturally adjust to the owner seat position, getting more comfortable in time after the break-in period” are two of the most important features that make them so special. 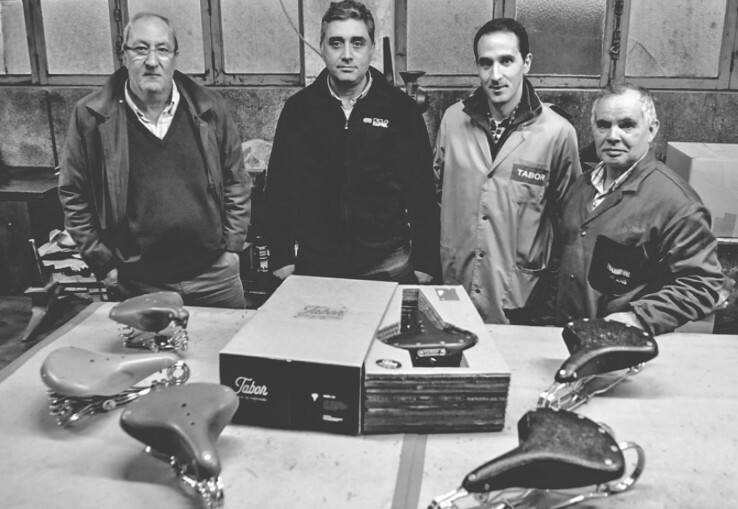 "The idea of forming a group emerged while rebuilding an old bicycle and I became aware that back in the old days Tabor used to manufacture a racer saddle model suitable for track racing bicycles". he then remembers to create that social virtual space to "gather all the sympathizers of the Tabor brand so that this line of saddles could somehow be produced again". We are welcoming the idea and are resuming the process to manufacture the sportier, less springy model ;). Gourmet product, manufactured through basic processes. 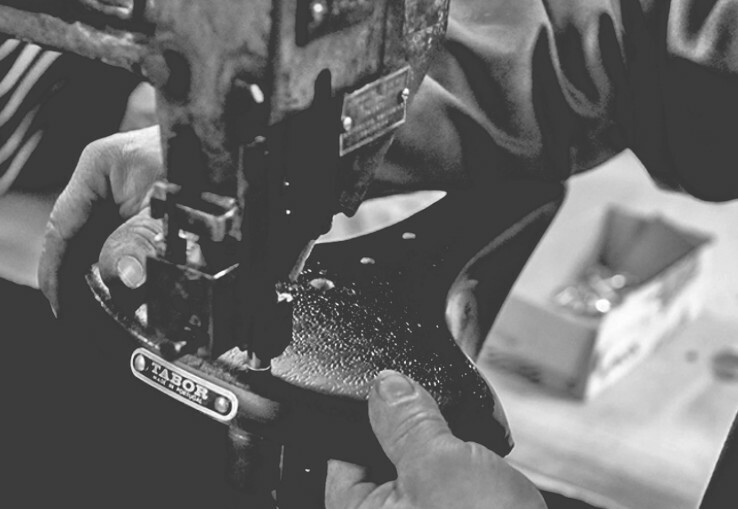 On a tour of the Tabor plant, one soon realizes what makes these saddles so unique: Despite the love and care put into the making of each saddle, the manual labour assumes a relevant significance of the process that leads to each saddle "birth". All the saddle components are made indoors with the exception of metal surface finish. To what concerns the machinery necessary to manufacture the saddles, one can say that the Time-machine has stopped almost 30 years ago.There's no innovation in this type of equipment; not at Tabor neither in any of the other firms that still dedicate themselves to build this type of natural leather saddles (very few by now) around the world. They are all basically the same in terms of manufacturing processes. This limitation is not regarded as such, though: if production starts to be industrialized, it may risk losing its character and intrinsic value. At the steering wheel of the heavy machinery that enables the saddle production, Tabor has in charge Mr. Ilídio Oliveira: with 58 years old, began to work at the plant over 41 years ago. He has always worked in the saddle department. 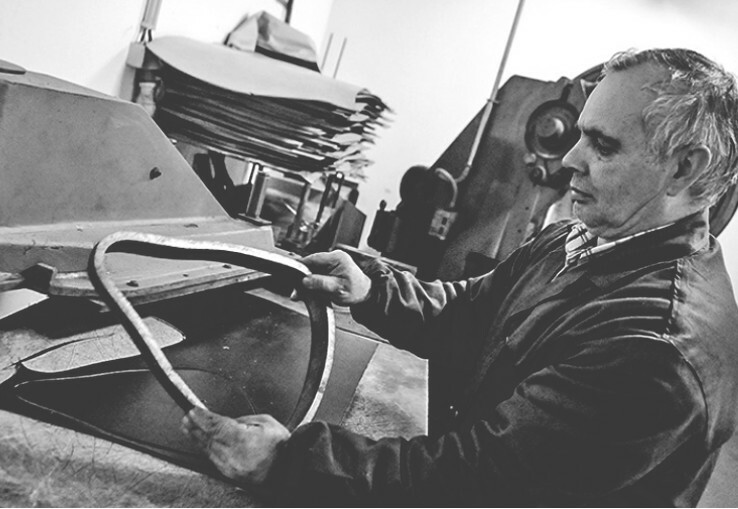 Even if previously he was more dedicated to the steel frame manufacturing, today, all the production processes roll over his hands and approval, overseeing every stage of the saddles manufacturing, from start to finish. Being an arduous work and to be able to keep quality standards until the very end of a long chain of production processes, one has to have a large amount of expertise to know the quality and nuances of cow leather, processes, and cares that this very same leather has to undergo until the saddle reaches its final form... It's up to him to select the best leathers and soaking them in water for five full days in order to make them workable. After that, they pass to the next stages: cutting, molding, branding, riveting, etc. Then, every inch of leather is carefully inspected before they are assembled to the rest of the metal parts that form the Tabor Saddle!